This entry was posted on Friday, July 3rd, 2009 at 4:05 pm and is filed under Media Center. You can follow any responses to this entry through the RSS 2.0 feed. Both comments and pings are currently closed. Ben, the trouble is…you generally cannot see the numbers through the small window. I know…I’ve tried. That’s odd, when I bought my latest one I was able to verify it was a Jasper before I took it to the counter. I bought one about a month ago and I was looking through the little hole just like the picture showed. Only, I didn’t know about the Amp rating difference.. I was told the clue was the manufactured date. I don’t have the link anymore. I think your way is definately more accurate. I’m not sure how many facilities they have producing them and which ones are up-to-date blah blah blah. I got lucky. Did yours have 256MB internal storage or 512MB. More internal storage is included in the newest additions. I had to go through 3 or 4 units on the shelf before I could find one that was readable, and then I had to shake the box a little to shuffle the unit in the box over enough to get it to where I could read the rating. Definitely quieter but like Ben said, not enough to be quiet enough for home theater use. Since I bought this one as an extender, I stashed it into a dresser on which sits my bedroom TV, vented the back with a saw and drill. I monitored the temp in the dresser with the doors closed and I’m well below 80 degrees in there … you just have to make sure all the hot air pumping out the back of the unit leave the enclosure. This means that you’re still going to hear the fans, but it’s now an acceptable level. […] If you buy a 360 made this year it should have the jasper chip which supposedly fixed the heat issue, that caused the Red Ring of Death. So if you buy one, buy a new one. I have a 2009 version with the Jasper chip and have had no problems. I found a jasper easily by looking at the power rating as shown in the picture above. i have a pro 60 gb.manufactured in 2009-6-23.is it a falcon or a jasper chip? thanks, ben. just got an elite 360 from walmart.com. it is, indeed, a jasper. cool! Thanks so much Ben! I got a great deal on walmart.com and got lucky that it is a Jasper! I would not have known what an awesome deal it was without you! I have a question. The ‘Jaspers’ that people are on about aren’t anything to do with the Xbox 360 Elite are they? I’ve had my Xbox 360 Elite for over 2 years now and there’s no hint of RROD (now I’ve said that no doubt it will die….) and was wondering if the RROD issue even affects Xbox 360 Elites? Hey Amy , I have a Elite it’s DOB is 01/19/07 its a Falcon and its a POCrap. 3 RROD (with 2 diffrent codes) in less than a yr. It was bought used (Ebay lol) so the seal was breached. My question is , other than power supply how does the Jasper differ from the Falcon ? I hear less likely of RROD but is this accurate ? If I were to buy lets say the new Elite bundle out with the 2 games is there a chance I could still get a falcon. 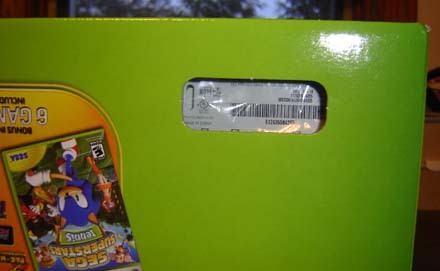 They lock the boxes up so Its hard to see. They take the console from locked drawer straight to the register. Thanks Ben for this info. Awesome. I’m sick of the RROD snake bite. Ok so I am totally confused. 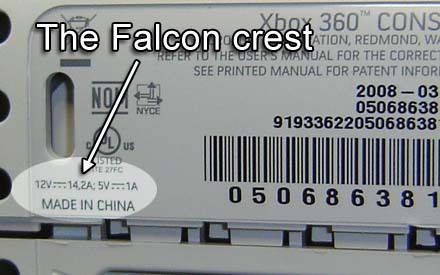 I just sold an xbox 360 elite with a date code of March 10, 2010 but the label says it uses 16.5 amps. I potential buyer told me from the manufacture date that it had to be jasper. but the amps do not confirm that. We had sent our unit in to microsoft and this newer one is what they sent us back. So does anyone know which chip this is? excellent site, i indeed have a jasper boyakasha. Just picked up a used Jasper 360 from my work. 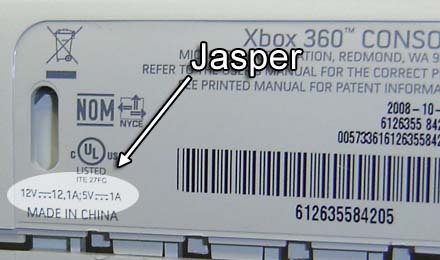 I didn’t know about the amp differences, but… I figured that there’s no reason for Microsoft to be manufacturing older generation 360ies after the new ones have come out, so… All of you have have gotten your 360 that was manufactured in ’09-’10 that’s not a Vejle…it’s a Jasper. Happy to report your Google juice is still working. +2 karma to you. 🙂 Thanks!